If you have ever had a car catch on fire, you know it is a scary thing. There is a point with every fire that no amount of handheld fire extinguisher will help. However a small handheld extinguisher deployed quick enough can extinguish a fire. Without getting into too many details, there are four main types of fires. A,B,C, and D. Each has an extinguishing agent that puts it out best. There are pros and cons to each. Most cars you are going to normally have a burning liquid, oil or fuel, that will also burn some materials. So a class B,A fire. B being a burning liquid, A being paper, carpet, that kind of thing. C being electrical, so a non conductive agent. D being a burning metal. Right after we got our NISMO, we decided to mount a fire extinguisher. We had seen the seat mounted brackets, and they seemed like a good idea. Some people don't like the idea of a fire extinguisher here. Like anything there are positives and negatives to anything. To us having the extinguisher close at hand, within reach far out weighed any negatives. The H3R bracket and extinguisher fit the spot, and allowed nearly full movement of the seat. We normally drive an R32 seat all the way back, so especially no problem. You never want to have to use an extinguisher on a car, but we have had to more than once. 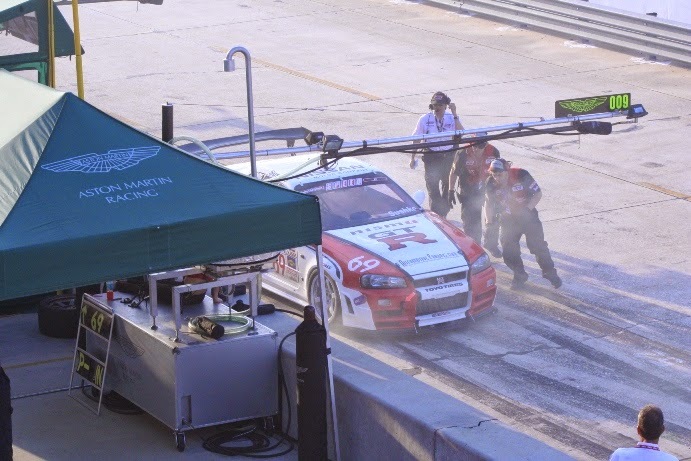 During the first race of the World Challenge season in 2006, the R34 cracked one of the oil supply lines after a bolt loosened up. This line started to leak on the heat wrapped downpipe. 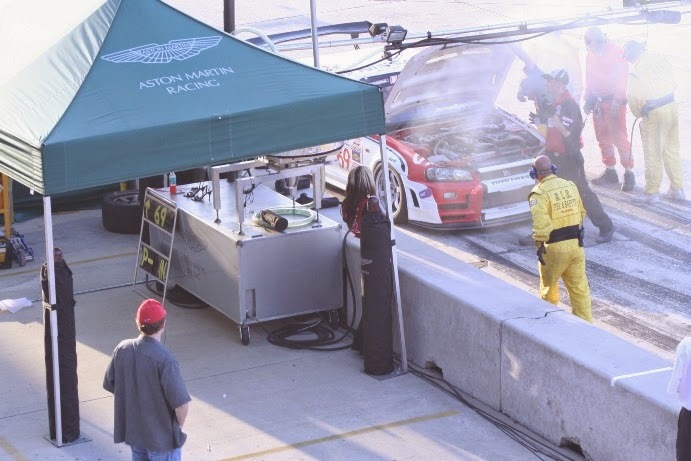 We got black flagged, and came into the pits to investigate.